We’re one month closer to seeing those growing outside! And it’s a short month, too! (But I’m not going to discount possible cold and snow in March.) Happy weekend! Those tulips make me smile! Thank you for sharing and have a great weekend! Yes it will! And February is the month of Patty! 🙂 Go Pat’s…have a great weekend Carole! We have so many bulbs sprouting this year since we’ve had almost no freezing weather (sorry). I think the Pats will dominate on Sunday! Tulips are my all time favorite flower! Very pretty! Happy Not Quite Spring! Those tulips made my day. Hope! Have a great weekend and good luck to the Pats! I thought February was Tulip Month? 😉 I’ve seen 4″ high shoots of daffodils … growing in the ground. Spring is gonna come! Pretty tulips! It’s supposed to get cold here this weekend and maybe even snow; I hope the daffodils that have sprouted won’t mind! Have a nice weekend. 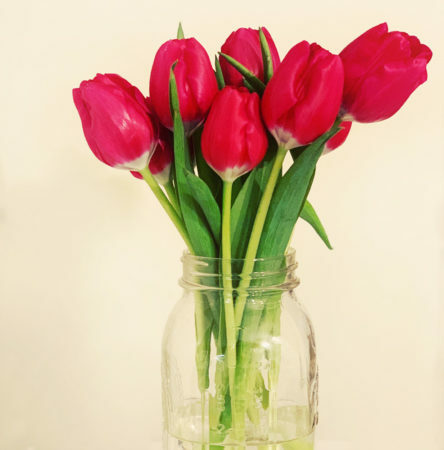 I love seeing those tulips – bright and cheerful for February. Lovely! I was thinking the other day now that I have a house I should just buy a gazillion tulip bulbs this fall and plant them so I can bring them indoors.